Art Portfolio Cases 30" x 24" x 6"
Artwork Portfolio & Sign TuffBox Transport Case - ID 30" x 24" x 6"
Click the button below to add the Artwork Portfolio & Sign TuffBox Transport Case - ID 30" x 24" x 6" to your wish list. Inside Dimensions 30" x 24" x 6"
These art portfolio cases are lightweight, easy to carry, and built with durable materials to ensure long life and excellent performance when needing to keep your artwork safe from damage. The art portfolio cases feature a metal carrying handle, 1/4" plywood construction, and moisture resistant materials to ensure protection. The art portfolio cases are ideally suited for both storage and transport of your art, signs or paintings. Thank you considering us. If anything breaks or fails with one of our cases for a period of 3 months after purchase, we will fix it provided it wasn't abused......plain and simple! If you have a problem call us immediately and we will discuss all options with you. There are many solutions that we can take in order to fix problems, issues, and damages. Most of which can be done without having to send the entire case back to our factory. Customer satisfaction is paramount to our continued success and we will always communicate and be extremely fair and honest with you. 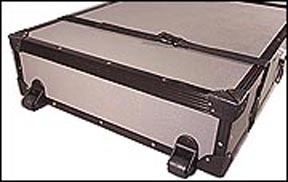 Road Cases USA has been in business for over 35 years and have not grown to become one of the leading case manufactures in America by not standing behind our product. We will take care of you. I am pleased with the product and the service. I have tried multiple different methods of transporting framed artwork without damaging the frames. 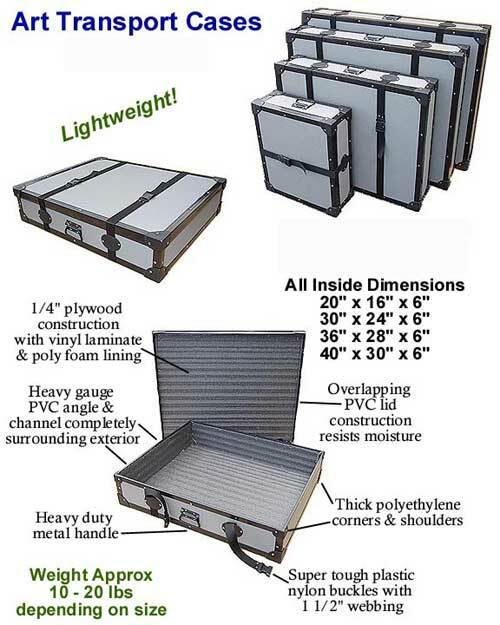 This product works the best for me, and is also the most compact transport method. I am also hoping that future nicks and scratches to my wooden gallery frames will be eliminated. I am so very pleased with Road Cases! I had a difficult time finding a case to transport my art piece through checked luggage. It needed to be strong and light. I inquired at various art stores in my area, looked online, and finally found Road Cases. * When I called, a real person answered the phone. * Very helpful and friendly customer service - I had a question about having the case sent priority as I needed it in a timely manner. The woman I spoke with assured me that it should be delivered in time, that I shouldn't spend more money than I had to, and if it looked like it was going to be an issue, then we could discuss the possibility of me paying more for priority shipping. I so appreciated this! *And* it did arrive in a timely manner! * The products are made in the USA. Thank you so much! I will be recommending your company and services to others. First off, there is something about the vibes from the company. It feels "right" to do business with them. The transaction was very clean and fast - no problems whatsoever. When I ordered, I was disappointed that I couldn't find a size closer to 20x24, but now I am happy with the size I purchased. Cases with casters are great for when I am carrying them, but I think I will order cases without casters for shipping. The materials were a little bit lighter than I expected, but the case seems to be well made and strong, and I do not need the extra weight. Cases cost a lot, but I haven't found a better product. I will order more cases, and recommend them to my friends. Was please when I received this case. It has sturdy sides and reinforced corners for extra security. Just what we needed! We were very pleased with the quality of the unit (exactly as described) and the speed of the transaction. If I had known this quality of case was available for this price sooner - it would have saved me lots of grief. Artwork Portfolio & Sign TuffBox Transport Case - ID 36" x 28" x 6"
Artwork Portfolio & Sign TuffBox Transport Case - ID 40" x 30" x 6"
Artwork Portfolio & Sign TuffBox Transport Case - ID 20" x 16" x 6"
Artwork & Sign 1/4" Ply ATA Road Case w/Wheels - ID 30" x 24" x 8"
Artwork & Sign 1/4" Ply ATA Road Case w/Wheels - ID 36" x 28" x 8"